- Publisher More than 300,000 readers have enjoyed the Scripture verses, stories, prayers, and poems of Anita Corrine Donihue's devotional classic When I'm on My Knees. Now they can pen their own prayer requests, praise notes, and favorite Scriptures in this handsome companion volume. Each page includes a brief thought from When I'm on My Knees, and plenty of writing space. It's a perfect addition to Anita's popular devotional series for women. 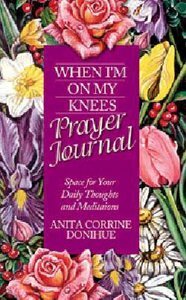 About "When I'm on My Knees (Prayer Journal)"
More than 300,000 readers have enjoyed the Scripture verses, stories, prayers, and poems of Anita Corrine Donihue's devotional classic When I'm on My Knees. Now they can pen their own prayer requests, praise notes, and favorite Scriptures in this handsome companion volume. Each page includes a brief thought from When I'm on My Knees, and plenty of writing space. It's a perfect addition to Anita's popular devotional series for women.